In today’s video, we’re going to talk about the Henle level system, which is a great way to get a sense of the difficulty level of piano pieces. When we’re learning Classical music, we talk a lot about grades. As in, “I just did my grade 8 exam”, or “I play at a grade 3 level”. These grades in music are almost always going to be referring to the ABRSM school or the RCM school (check out those videos for more details). As a self-taught piano student, or just someone who wants more depth of understanding for what their teacher is assigning, it’s really useful to have an understanding of grades. It’s what lets you know what types of pieces you could be learning – what’s too easy, what’s too difficult, and what’s right in your sweet spot. So when the Henle level system was brought to my attention, I was curious. The more information, the better – right? So that’s what we’re going to talk about today. What is Henle, what’s with the Henle level system, and why does it even matter? I apologize for not remembering exactly who brought this to my attention – if you’re watching this video, please let me know – but if it weren’t for you, out there on YouTube, I wouldn’t have known this system existed. So let’s start with the big question: who is Henle? And why should we care about the Henle level system? In 1948, there was a German man named Gunther Henle who started a (now very famous) music publishing house. Their whole aim was to publish music that was as close to the composers’ intention as possible, with minimal meddling and editing (we call this “urtext”). You’d recognize these books by their covers right away – they’re in a very specific shade of blue, and they’re very high quality. These books come at a premium price, but the binding is some of the best around (they actually lay flat! ), and the editing and printing is very reliable. It’s basically always been a family business, now being run by Felix Henle, Gunther Henle’s grandson (as of 2016). Okay, so that’s Henle itself. But what about the Henle level system? In 2010, they asked a man named Rolf Koenen to rank a huge amount of Classical music by level of difficulty. Rolf is a renowned pianist, musician and professor. He knew some Henle editors personally, so that, coupled with his qualifications, is likely why he was given this huge task. So if you find yourself wondering what you should be learning, or you feel like you’re floating in a sea of random music with no idea how to choose, you’ll likely find a lot of value out of the Henle level system. What I like about it is its ease of use. Basically any important musical work between the Baroque and 20th Century can be found in their library. And it gets incredibly specific. Instead of labeling an entire book at a certain level (like the Well-Tempered Clavier), each individual piece in the book gets a level ranking. Where it differs from RCM/ABRSM is that it ONLY levels Classical-type music. In the RCM syllabus, for example, you’ll see graded pieces from Classical repertoire, but also super-modern pieces. Henle is very focused on one thing, which I actually think is its greatest strength. 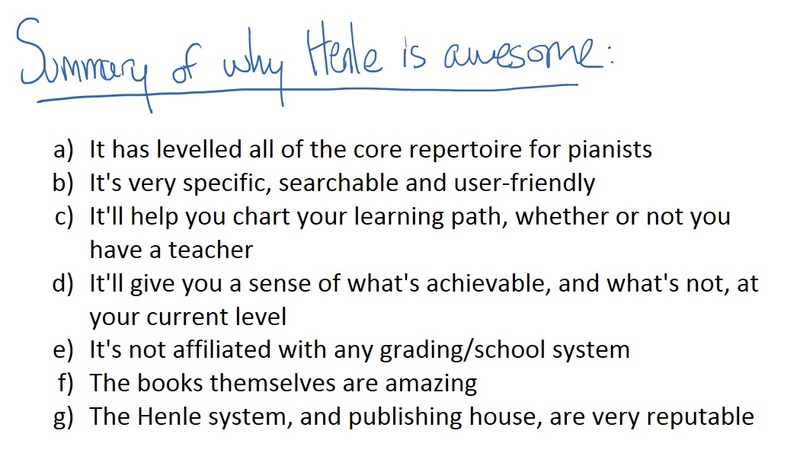 So now let’s talk about how to use the Henle level system, and how it all works. Within those categories are 3 individual levels. So 1, 2 and 3 would be easy, 4, 5, and 6 would be medium, and 7, 8 and 9 would be difficult. To give a halfway point between levels. One thing you might have noticed right away is that the easiest level, level 1, doesn’t start with purely beginner music. The easiest pieces, such as Minuet in G (which we’ve featured on this channel), is rated level 1 by Henle, but is considered a grade 3 piece by the RCM/ABRSM. This means you still need to go through a period of “musical kindergarten” before attempting Level 1 music. Go through your method books, learn the basics, and then see if you can play these pieces. On the Henle website, you can actually search for music based on their levels. So if I search for music at a level 1, it leads me to books/collections that contain pieces at a level 1. So our top result, for example, is Bach’s famous collection “Notebook for Anna Magdalena Bach”. If we check out that collection, we can see that each and every piece within is rated. And there we can see that everything is mainly between a level 1-3, so if we were to purchase this book, it would benefit us throughout our entire “beginner” journey. You can also search for music based on the time period (Baroque, Romantic, etc) or composer. I highly encourage you to explore this website – there are a lot of fun discoveries to make here. The main strength of the Henle level system is its ability to rank extremely difficult pieces. For example, the third Liebestraum from Liszt’s set is considered “ABRSM” difficulty according to the RCM. This is University-level, and the second most difficult level in the RCM (LRCM being the highest, and few people make it to this point). However, this Liebestraum is ranked 6/7 difficulty on Henle’s scale. That means there are three more levels of difficulty beyond this piece! Pieces at an ABRSM or LRCM level can vary wildly in difficulty, but the Henle system gets much more granular and specific. And that’s all for today’s video on the Henle level system. If you missed the links in the post, you can check out and explore Henle’s website here. I’m sure you’ll find tons of value in it!